We put great pride into our food being prepared from fresh, local groceries with high quality. Right outside the door, we have the big ocean with an exciting selection of fish, and in the dunes, you can find sea buckthorn. In the bog, the most delicious potatoes grow and we use local vegetables during the season. Restaurant Løkken Badehotel has its own bee farm and there is a swarming activity in the production of honey in the summer. The honey you can taste together with cheeses from two of the local dairies (Sønderhaven Gårdmejeri and Ingstrup Mejeri). At Restaurant Løkken Badehotel you will get an authentic experience of Danish food combined with French notes, prepared from local produce and a splash of ocean served in storytelling surroundings. This seaside hotel in Løkken dates back to 1895 and there are long and proud traditions tied to the charismatic and historical buildings. 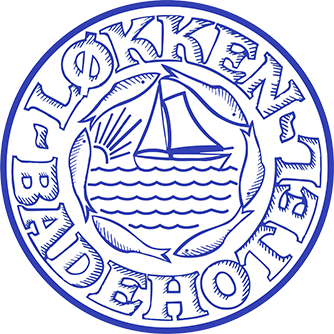 In Løkken’s first tourist brochure from 1895, our great place is described with the following words: “Løkken Beach – the absolute best spot for North Sea swimmers.” And this still applies! During the summertime, we have beach life right outside the door. On the cooler days, it is long walks and the seagulls’ cries. We have the wind, the boats of fishermen being hauled onto the beach, lyme grass and roses in the dunes, endless wide, white beaches and a lot more. These magnificent things are what make our place a unique experience, both when it comes to food, surroundings, atmosphere and nature.